I actually got a lot of knitting done over my winter break this year. It really helped that we got stuck in Portland due to snow. We had decided to take the train up to Portland the day before our flight, and they ended up canceling all flights out of Portland an hour after we had arrived off the train. This meant we spent a few more days with our friends than had anticipated. Luckily, that meant lots of knitting time. I got a large chunk done on my wedding shawl, which I showed off a few days ago, and I got close to finishing my one and only knitted Christmas gift. I made myself a tee as a practice, then made my sister one to almost match. They have mirror image leaf panels slightly offset to the side. The original pattern is Leaf T-shirt by Melissa LaBarre (ravelry), and the leaf panel is set in the center. I gave it purposely to her unfinished so that I could make sure I got the length right on her (she is five inches taller than me after all). My sister gave me some yarn for Christmas, so while I was there I knit it up into a scarf. I had been wanting to do this pattern (My So Called Scarf by Allison Isaacs – ravelry) for a long time and this yarn just seemed like the perfect opportunity. It actually has already see quite a bit of wear. 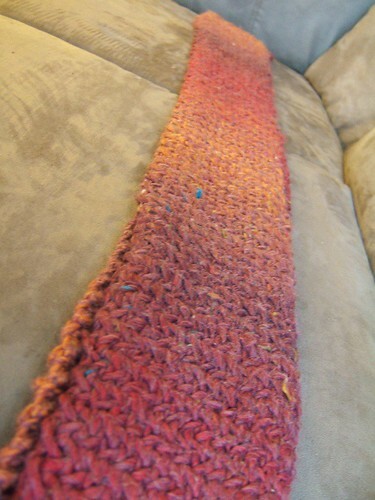 The scarf ended up nice an long, is soft, but will probably pill quite a bit as it ages. It took me only a few days to whip this up, so it’s definitely on the list of things I would knit again. Next time, probably as a gift. Both of the t-shirts and the scarf are marvelous! :) I like the motif off-set. nice!